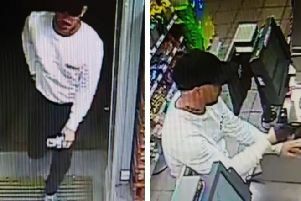 Police are searching for a man in connection with the theft of 15 different charity tins. Officers believe the man is linked to a series of thefts, believed to have started in November and spanning until May 26. The suspect has been captured on CCTV, which has been shared by Sussex Police. Police received reports of charity tins being stolen from businesses in Eastbourne, Rye, St Leonards, Hailsham, Roberstbridge, Uckfield and Lewes. The man is described as white, 5ft 10ins, in his early 60s and with white hair. Investigating officer Anna Archer said: “We have received reports of charity tins being stolen across the County and we have managed to obtain CCTV for a number of these thefts. “Any theft is unacceptable but stealing money from a charity is particularly abhorrent. To report information to Sussex Police go online or call 101 quoting reference 773 of 10/04.